The S Pen stylus has long been the signature feature of the Note series, and this year, it's more useful than ever. The S Pen has been completely rebuilt with a new Bluetooth Low Energy module that enables a wireless connection up to ten meters away and allows you to use it as a remote control. By default, long pressing the S Pen's button launches the camera app (although you can change this to any app you like). Once you've opened the camera, click once to take a picture, or click twice to switch between the front and rear camera. It's really convenient and a great way to take selfies without having to awkwardly reach for the volume button or on-screen shutter. Using a remote shutter also helps keep the phone stable, resulting in sharper photos. The remote control feature works in other apps too. In YouTube, Spotify, and Samsung Music you can click once to pause/unpause, or click twice to advance to the next video/track. In Microsoft Office Powerpoint, you can click once to go forward one slide, or twice to go back a slide. In Chrome, click once to go back a page, and twice to go forward. In total, there are 11 apps that currently work with the S Pen Remote. If an app is compatible, a little badge will pop up to alert you - hovering over the badge will tell you what actions are available. Samsung has also made the S Pen Remote SDK available to app developers, so expect more compatibility to be added soon. 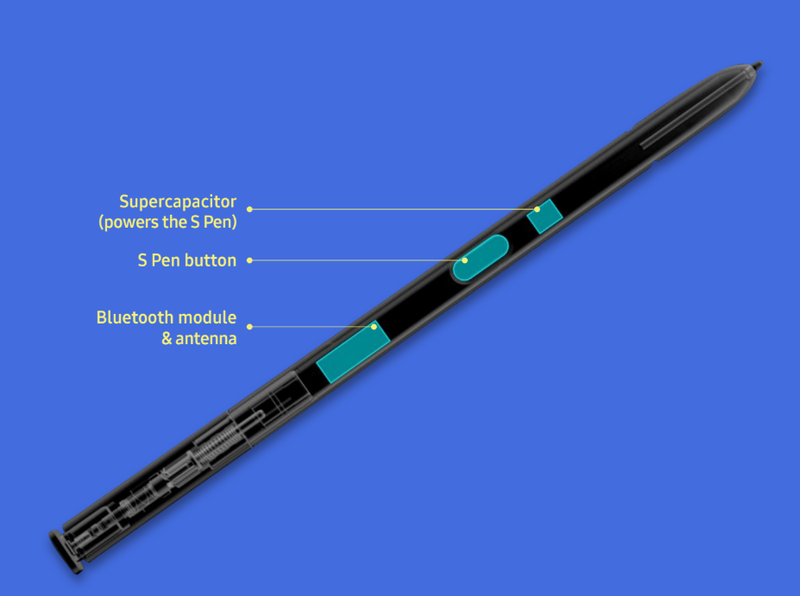 The S Pen's remote control feature requires power to work, but fortunately, the S Pen charges really fast thanks to its super capacitor battery. In fact, it takes just 40 seconds inside the phone to reach full charge, which will give you 30 minutes of standby time or about 200 clicks. In case you're wondering, turning Bluetooth off on your phone won't disable the S Pen's Remote feature, however turning Airplane mode on will. Of course, the S Pen is also still really useful for taking notes and sketching on the go. The stylus has the same 0.7mm tip and 4,096 levels of pressure sensitivity as its predecessor, and drawing with it on the Note 9's display feels fluid and responsive, and very close to writing with an actual pen. 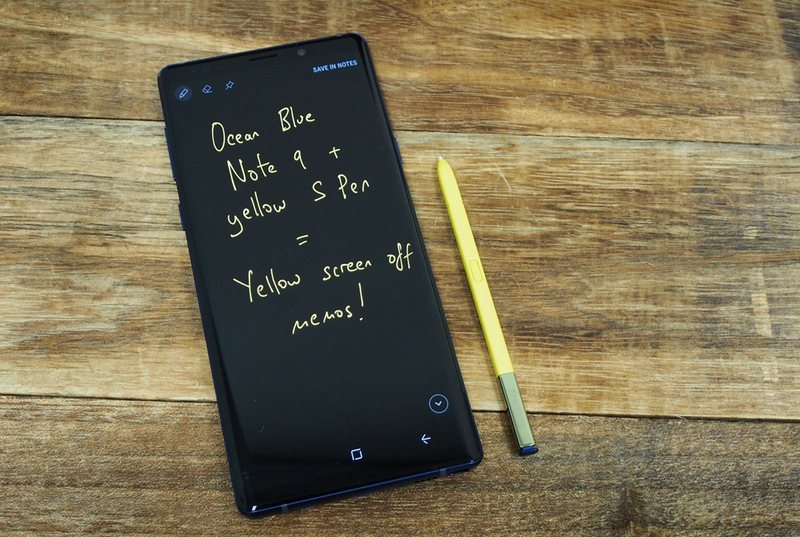 All of the useful Screen Off Memo and Air Command features are all still there, with one interesting new quirk being that Screen Off memos are now written in the same color as your stylus - yellow for the Ocean Blue's yellow S Pen, white for the Midnight Black model, purple for the Lavender Purple model and copper for the Metallic Copper model. Of course, Samsung has also added some new productivity features for the S Pen, my favorite being a new trace option that lets you overlay any picture and trace on it to create a drawing - perfect for people like me with no artistic talent. By the way, although the S Pen's remote control feature requires power to work, drawing and writing with it, or using Air Command don't, so even if you see the low battery warning, don't feel like you need to stop what you're doing. Desktop mode via a DeX dock was a nice feature introduced in the Note8, and it's now even easier to use on the Note9. You no longer need a dedicated dock to access Desktop mode, all you need is a USB-C to HDMI adaptor (any generic one will do). Connect the phone to any monitor or TV and you'll be able to use the phone's display as a trackpad, or you can wirelessly connect a mouse and keyboard. There are still a few benefits to using a DeX dock though. If you want to display a resolution higher than Full HD, you'll need a DeX dock, which can output up to 4K resolutions. 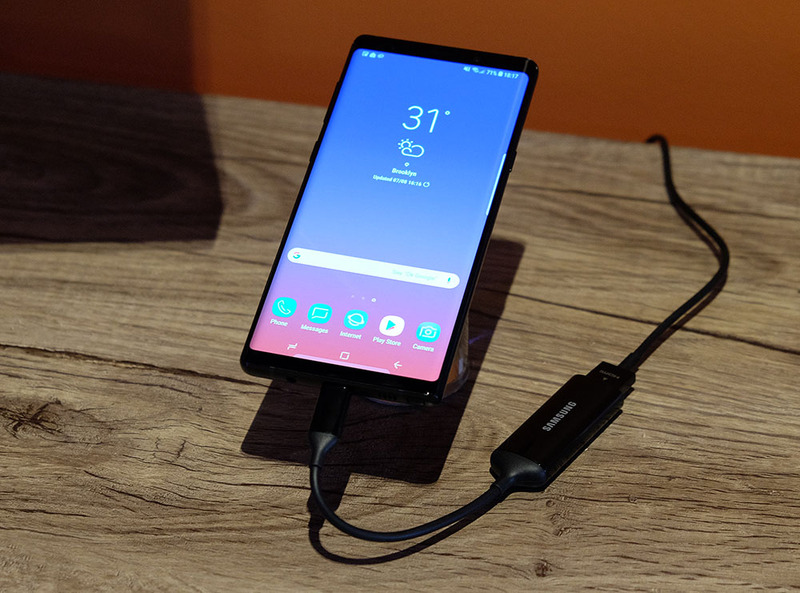 Additionally, the DeX dock will charge the Note9 while in use, whereas a USB-C to HDMI adaptor will not. Lastly, the DeX dock also comes with additional ports to plug in peripherals for longer desktop usage needs, which you forego when using the USB-C to HDMI adaptor. 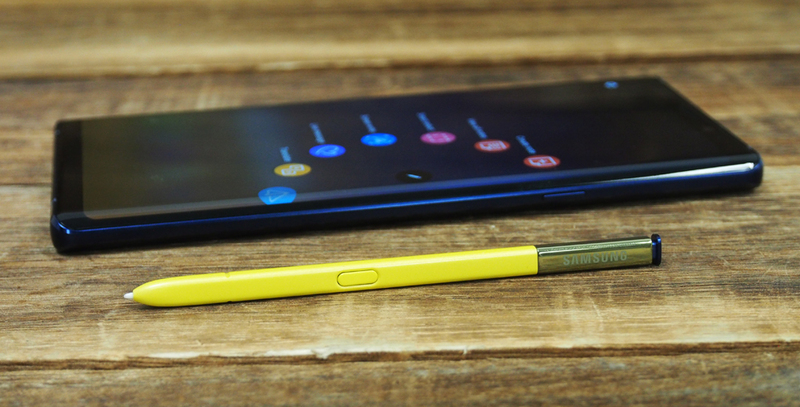 The Note9 features three forms of biometric authentication you can use to unlock it: fingerprint, Face Unlock, and Iris Scan. You can also opt for Intelligent Scan, a combination solution we first saw on the S9 and S9+ that uses both Face Unlock and Iris Scan. 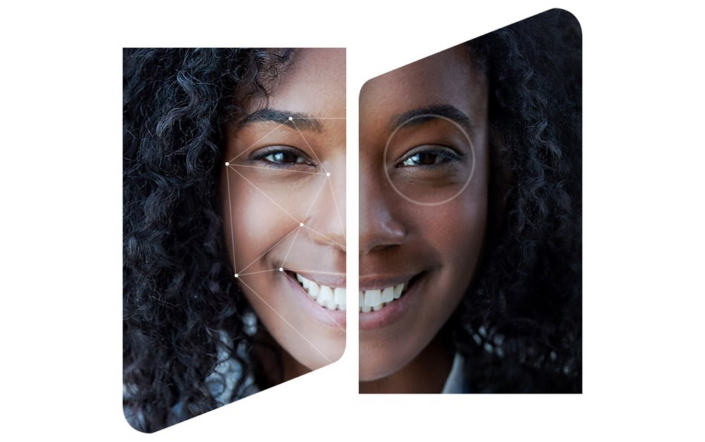 Intelligent Scan works by first using the front-facing camera to scan your face. If your phone fails to unlock (which might happen if there's insufficient light), the device will then check your irises. If both fail, Intelligent Scan will try to authenticate your identity using a combination of the two. This all happens almost instantaneously. At each step, Intelligent Scan also checks for spoofing, for example, if someone is trying to fool the phone with a picture of you. It's worth noting though that Samsung still warns that the most secure biometric authentication on the Note9 isn't Intelligent Scan, but Iris Scan. Intelligent Scan is more of a compromise between the more secure, but slower Iris Scan, and the less secure, but more convenient Face Unlock. By combining the two, it ensures that no matter what conditions you're in, some form of biometric security should unlock your phone. It's also worth noting that there's still no way to use Intelligent Scan for Samsung Pay - you'll need to use Iris Scan or Fingerprint unlock for that. The Note9 runs on Android 8.1 Oreo, which makes it almost identical to the S9 and S9+'s UI. That's not a bad thing, but considering Google just launched Android 9.0 Pie two weeks ago, Oreo is now old news. For now there's no update from Samsung on when Pie will be available for the Note9, but hopefully it doesn't take too long. Compared to last year's Note8, there are a couple of notable differences with the Note9's UI. For starters, there's now a landscape mode that automatically rotates the home screen when you're holding the phone sideways. However, for some reason, the display is locked into Portrait mode by default, and you have to go into Display -> Home Screen menu to turn off Portrait Lock first. Folders on your home screen can now be customized with a variety of color options. This option can be accessed through an icon on the top-right once a folder is expanded. You can even change the opacity of the color, view a history of your selections, and see a list of recommended colors for your theme. You can now also customize apps on your home screen with App Shortcuts, which is quite similar to how 3D Touch works on the iPhone. Each app is allowed up to five shortcuts, accessible by long-pressing on the icon. So for example, if you want your camera app to load straight into Selfie mode, you can long tap it, then select Selfie, or you can setup Twitter to launch directly into composing a new tweet, direct message, or search. Bixby, Samsung's virtual assistant, is also smarter now. Bixby Vision can translate signs and other text in real time, similar to the Google Translate app, however one big difference is that Bixby requires an internet connection to work, whereas the Google Translate app works offline. Bixby Vision is also smarter at recognizing objects, and now gives more information based on what you're looking at. For example, show it some food and it can tell you how many calories you're about to consume. Point it at the sky and it gives you the current temperature and weather report. Again though, you'll need an internet connection for any of this to work. Bixby is also supposed to be better at understanding natural speech and commands, however I had varying levels of success with this.